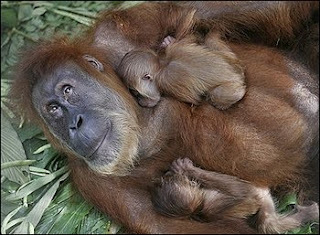 JAKARTA, Indonesia -- A blind orangutan at a rescue center in western Indonesia has given birth to a healthy pair of twins. Ian Singleton, who works with the Sumatran Orangutan Conservation Program, said Thursday that Gober, the mother, so far appeared able to care for the babies herself. "But vets and staff are ready to step in if necessary," he said, adding that Leuser, the father, also is blind. There are around 50,000 orangutans left in the wild, 90 percent of them in Indonesia, with more than 2,000 others in rescue centers. Some of those at centers were seized in the illegal wildlife trade and others orphaned when their mothers strayed from rapidly disappearing rain forests in search of food. The twins - a boy named Ganteng and a girl named Ginting - were born last Friday. "It's hoped that both infants will eventually be released to a life in the wild, something that has been denied both their parents due to their blindness," Singleton said. The twins' mother, who has cataracts in both eyes, was captured by vets two years ago in an area surrounded by palm oil plantations. They were worried she'd be killed by villagers for routinely raiding crops and took her to the rescue center. The father arrived in 2006 after he was found outside a village far from a national forest in Jambi province with 62 air rifle shots to his body. Several pellets were lodged in his eyes, leaving him sightless. "Normally we try to prevent orangutans breeding at the center," said Singleton. "But we decided to make an exception," he said, because having babies to care for would dramatically help to improve the mother's quality of life. Thank you Wanda for your heart filled comment. I agree that all she needs is to have some sort of sponsor that has money. That would great if she could see her babies growing up and really be able to protect them and watch them grow. All of the stories about the Apes make me cry. How would someone sponsor her? Who would a person call? I will find out the best person to contact if you or anyone else would like to donate for surgery for her, to be her sponsor. I will get back with you as soon as I know. Thank you soooooo much for asking this question. Please check back with me. I sent an e-mail to them, and received an auto reply saying that someone would get back with me as soon as they can. They speak German so I needed to translate. I am sure they will get back with me and I'll post the information as soon as I receive it. Dear Anon and anyone else that is interested in helping or being a sponsor for the surgery for gober. I have not heard anything back from them, however we need to understand that in most parts of the country where these sanctauries are they have to travel for the internet. I did get some information on them as far as phone numbers and address to send a letter to or call. I don't have the capability to call overseas on my plan, however anyone else that can, and please do, can call them. They would welcome your call. I hope there's someone out there that has a good heart and the resources and wants to see Gober be able to raise her own babies.